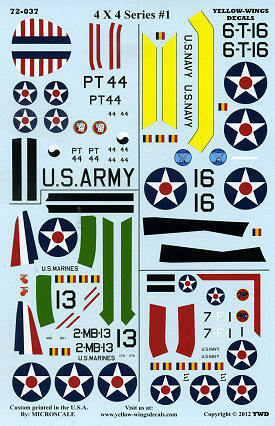 Yellow Wings Decals 1/72 sheets seem to be few and far between so it is very nice to see this one being released. It contains four different subjects on the same sheet. Each is complete with all the markings needed to build the model as depicted. First up is a TBD Devastator as assigned to VT-6 aboard the USS Enterprise in 1940. This one has a True Blue tail section along with a Lemon Yellow forward cowling. The yellow wing and fuselage bands are supplied on the sheet along with prop stripes and wing walk areas. Either the Airfix or Valom kits are recommended. Next is a USMC SBD-1 as attached to VMB-2 at San Diego in 1940. This one has a green forward cowling. The rudder stripes, fuselage and wing bands as well as prop stripes and wing walk areas are all on the decal sheet. No recommended kit is given as there is apparently no -1 Dauntless on the market. However, it should not be that difficult a conversion from later versions available. A USAAC P-36 Hawk is the next offering. This one is the commander's aircraft from the 77th Pursuit Squadron when based at Moffet Field. For this one, the red nose band will need to be painted to match the fuselage stripes. Either the Monogram or Special Hobby kit are recommended. The final option is an F3F-1 assigned to VF-7 aboard the USS Wasp in 1940. This one has black for the tail colors. A red forward cowling will need to be painted to match the red fuselage and wing stripes. 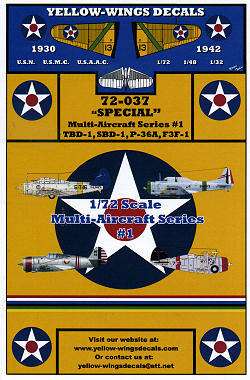 Special Hobby did an F3F-1 in this scale. The sheet is superbly printed by Microscale without any registration issues. It makes for a very interesting sheet and should stir some life into some older kits.